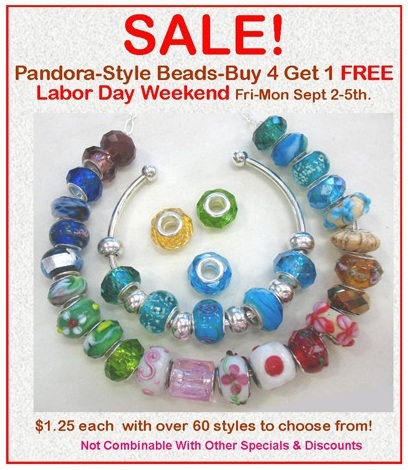 Labor Day Special: Free Pandora Style Beads! In celebration of Labor Day, the Bead Bazaar is having a give away over the coming weekend. Starting Friday September 5th, if you purchase 4 Pandora Style Beads, receive a 5th bead for free! This special is good through Labor Day (Monday, September 5th)! With over 60 colors and styles of interchangeable beads to choose from, this is the perfect opportunity to build some coordinating bracelet sets. Priced at $1.25 each, our silver plated interchangeable beads are a bargain compared to name brand prices! This special compounds, so if you purchase 8 beads you’ll receive a second bead free, purchase 12 beads to receive a third bead free, and so on. Don’t forget to check out our interchangeable bracelet options as well! New in stock are some silver plated cuff style bracelets. With one removable end for adding beads and 2 stopper beads included, these cuffs work perfectly to build interchangeable bracelets. If you’d prefer sterling, we have snake chain style bracelets with one removable end and sterling stopper beads sold separately. No matter your preference, we have everything you need to customize your bracelets! Interested in some of the history behind this popular trend? More info on interchangeable beads and bracelets can be found here!